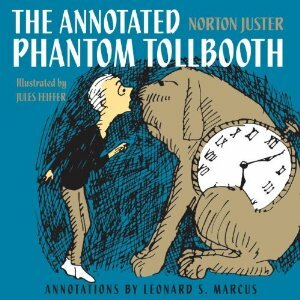 Back on September 20th, we celebrated Building a Library’s first anniversary and announced that, the following week, I was finally going to start reading The Phantom Tollbooth – the book that inspired this blog – to my almost six-year-old daughter. And then… I took the following week off. Anti-climatic, I know, but it was a crazy week with swim classes and TWO soccer games and I was exhausted and blocked and I apologize. 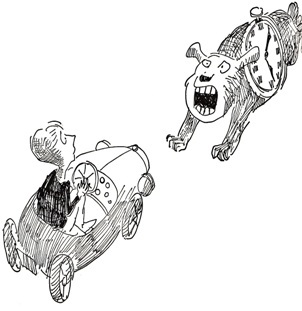 But, now that all my excuses are out on the table, I DID start reading The Phantom Tollbooth with my daughter last week and, so far, it’s been a pretty positive experience. 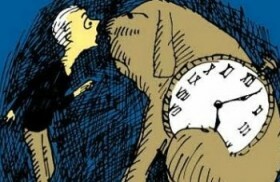 Let me state up front that I was a little worried that my daughter was too young for The Phantom Tollbooth. Norton Juster expertly plays with language and various abstract concepts throughout the book and I was concerned that aspects of the text would go over her head. 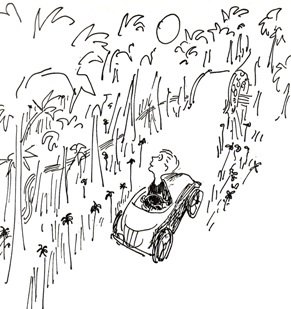 As far as I can remember, I probably first encountered The Phantom Tollbooth when I was eight or nine, so I will admit that I am (still) concerned that I might be trying to introduce the novel to my daughter at too early an age. But, regardless of those concerns, I wanted to give Phantom Tollbooth a shot in our coveted bedtime reading slot last week and I’m going to periodically give updates on how the reading is going so far. I’m calling this series “Phantom Tollbooth: First Read” and I’m planning to structure the updates in a similar style to the re-read or rewatch series that you can find on Tor.com or The Onion‘s AV Club. For those unfamiliar, in those series, the websites pick a book or a movie and a person episodically blogs their reaction to revisiting those works. For example, the blogger might post their ongoing reaction to rewatching all three seasons of Arrested Development or re-reading Stephen King’s Dark Tower books, chapter-by-chapter. 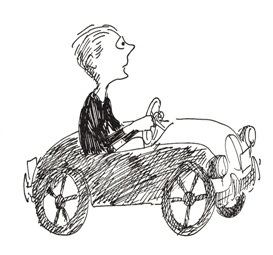 For Phantom Tollbooth, I’m going to adopt a chapter-by-chapter model, although some nights, we’ll be reading multiple chapters. For our first week, we started slow, only making it through the first four chapters. In the future, we may be moving through the book at a different pace, largely determined by what we’ve got going on that week. (Fair Warning: A trip to NYC will limit our progress this weekend.) I’ll give a quick summary of the chapter, my thoughts, my daughter’s reactions, and I might even toss in a few pieces of trivia from Leonard S. Marcus’ fantastic The Annotated Phantom Tollbooth as well. There once was a boy named Milo who didn’t know what to do with himself – not just sometimes, but always. When he was in school he longed to be out, and when he was out he longed to be in. On the way he thought about coming home, and coming home he thought about going. Wherever he was he wished he were somewhere else, and when he got there he wondered why he’s bothered. Nothing really interested him – least of all the things that should have. Inside the box, Milo finds “ONE GENUINE TURNPIKE TOLLBOOTH” with instructions for its assembly and use. It also comes with three coins for paying tolls, precautionary signs, a map of the lands beyond (“up to date and carefully drawn by master cartographers, depicting natural and man-made features”), and a book of rules and traffic regulations. Milo assembles the tollbooth and, “since, at the time, there was nothing else he wanted to play with,” he sets everything up, dusts off his small electric toy car, and prepares to make his way through the tollbooth. He randomly pokes his finger at the map in search of a destination – “Dictionopolis… Oh, well, I might as well go there as anywhere” – deposits his coin, and drives off in his toy car through the tollbooth. I tried to explain, “Well, they’re playing around with the meanings of words. Like, isn’t it funny to go to a place actually called EXPECTATIONS right before you get to the place you want to go?” She shot me a dark look in response. “I guess.” At this point, I apparently looked dejected and my daughter grabbed my hand and said, “But I’m still really liking it, Daddy,” which was both incredibly sweet and a little pathetic. She can tell that I REALLY want her to like this book and she’s trying to protect my feelings. Again, that’s adorable, but it’s insane for me to put that kind of baggage onto a kid. That’s like a guaranteed way for me to ensure that she won’t enjoy The Phantom Tollbooth. After the Watchdog recoils at Milo’s suggestion that he’s just “killing time,” he further bristles at Milo’s request for help to find the way to Dictionopolis. “Help you! You must help yourself,” the Watchdog argues. “I guess I just wasn’t thinking,” said Milo. “I’m afraid I don’t,” admitted Milo, feeling quite stupid. So Milo and the Watchdog get back on the road, headed towards Dictionopolis and Chapter Three. So, that’s us done reading chapters one and two of The Phantom Tollbooth. I’ll try to post my daughter’s reaction to chapter three soon – as a preview, just know that there’s a moment in chapter three that made my kid say out loud, “OH! So THAT’s what the book is about!” Hope this isn’t too painful to follow along with. 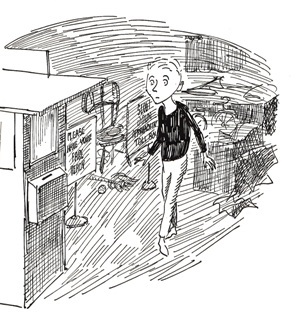 If you have your own memories of reading The Phantom Tollbooth, please feel free to share them in the comments section below. Juster recalled: “When I was a child, almost all presents, it seemed, came in pieces and had to be put together. Some I loved, like erector sets and model airplanes. In fact, I think I learned to read well, and carefully, by poring over the directions for putting together model airplanes. … To me any real present required participation and patience” (N.J., Notes I, p. 4). Referring to the moment when the Watchdog jumps into the car with Milo at the end of the chapter. Maurice Sendak singled out this scene as a favorite: “You know you’re in excellent hands when, in the midst of some nutty, didactic dialogue, the author disarms you. … It’s what Tock, the literal watchdog … says next that makes my heart melt, as it did on my very first reading way back when: ‘Do you mind if I get in? I love automobile rides.’ There is the teeming-brained Norton Juster touching just the right note at just the right moment” (“An Appreciation,” by M.S. for the 35th-anniversary U.S. edition, 1996). Previous post: Building a Library Is Celebrating Its One Year Anniversary Today!